EUSR approved water and gas utility pipe flange connections training. ECITB and Energy Institute approved flange integrity training for the industrial, pharmaceutical and distillery sectors. William Johnston and Company Limited enjoy an enviable reputation in the U.K. as the leading gasket manufacturer and flange gasket/bolt kit supplier to the water and gas pipeline utility sectors. We are approved to ISO9001:2015 standard. We are the only company in the UK supplying utility gasket/bolt sets, who technically support the products that we manufacture and know that, if properly installed, they will assist in reducing both ongoing leakage and maintenance costs. We have the broadest range of utility gasket types available in the UK. • EPDM flange gaskets that are WRAS, BS 6920 W70, W270, or DIN EN 681-1 approved. • Nitrile flange gaskets approved to DIN-DVGW, BS EN 682:2002 or BS 2494G. • Aramid fibre gaskets approved to WRAS, BS7531, GISF7, DIN-DVGW and NG-5123 AR0822. • Bespoke WRAS approved Cammprofile gaskets that are engineered to solve your specific sealing issue. • We have industry proven solutions for all utility flange to flange connection types. Having the correct gasket type is only part of the solution. Correct installation techniques and installation torque are essential to making a long term flange connection leak free. With over 50 years experience and backed by Best Availabe Techniques (BAT) in flange assembly William Johnston and Company Limited have partnered with Controlpoint Limited to raise and maintain the quality of flange assembly connections. A Hydrostatic test will only ensure leak free at moment of install. Does it ensure a leak free lifespan? ControlPoint is a training and quality assurance company that works with contractors and utilities to improve and maintain the quality of utility assets. Now available, an Energy Utility Skills Register (EUSR) approved training course that adresses the specific flange connection types and issues commonly found in the water and gas utility sectors. A Leak free pipeline does not happen by chance. It is an ongoing process! ControlPoint offers a proven system that helps contractors and utilities to build compliant, leak-free networks that last their expected lifetime. Training can be provided at their purpose-built facility in Chesterfied or on your site or premises. Download our EUSR Approved Utility Pipeline Flange Training PDF. Below are some of the companies ControlPoint work with. Read more about ControlPoint here. Technical support on complex flange sealing is offered and non-standard solutions can be engineered to address challenging connection types. To succesfully make a leak free joint utilising the broad diversity of flange types in the water industry requires training and ongoing installation management. William Johnston & Company’s staff helped resolve problems Farrans were having identifying suitable gaskets and bolts. I would not hesitate contacting them in the future for advice on bolt/gasket issues. Over 90% of rubber flange gaskets are installed too tight! • Over compression of rubber gaskets creates long -term leakage! • How many contractors know the specific installation torque value for a flange gasket yet alone how to properly apply it? • Fastener assembly loading can be controlled by using a torque spanner. • Friction is controlled by lubrication. EUSR approved training will show you how! William Johnston & Company Limited has been supplying gasket based sealing solutions for pipeline applications throughout the UK and on projects across the world for nearly 70 years. We combine this experience with the global expertise of the Flexitallic group as their Allied Distributor. The Flexitallic Group is the international market leader in the manufacture and supply of static sealing solutions, delivering industrial gaskets on a global scale. A division of the Flexitallic Group is The Academy of Joint Integrity which was formed to provide the process industry with access to the best training available, in order to ensure the efficient operation of plants and equipment. In collaboration with The Academy of Joint Integrity we can offer a range of training courses that are either Energy Institute or Engineering Construction Industry Training Board approved. Each course is aligned to industry best practice, and provides a blend of sealing technology and practical elements associated with flange assembly. • Are your gaskets fit for purpose and compliant with current legislation? • Are your gaskets fire safe? • Are your maintenance team or contractors certified in flange assembly? • Do you have a flange assembly bolting procedure compliant with industry best practice that would pass HSE scrutiny? Bolted flanged connections have been identified as a potential major safety issue in all industries. Ageing assets provide specific challenges with corrosion and antiquated sealing technology. The necessity for appropriately trained and certified installers has never been more prevalent. Correct gasket selection and installation are essential to safe operations. If the correct gasket is not ordered, or if it is not installed correctly by competent maintenance personnel, the gasket could be the root cause of a major HSE investigation. 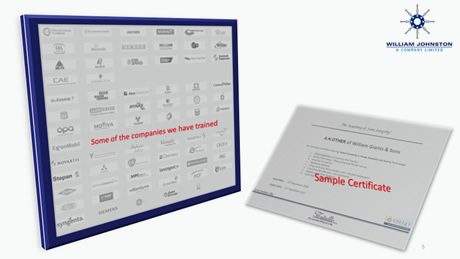 Download our Academy of Joint Integrity PDF. Download our Approved Distillery Training PDF. I never cease to be impressed with the instumented flange demo unit and the other delegates clearly enjoyed that as well. I find the way you can combine new innovations into existing products to provide high integrity solutions to ageing plant very interesting. Contact William Johnston and Company Limited today to discuss how we can assist you. For more information about our Gasket products and services that are available world wide, contact us on +44 (0)141 620 1666, Email us or simply complete our online Enquiry Form.